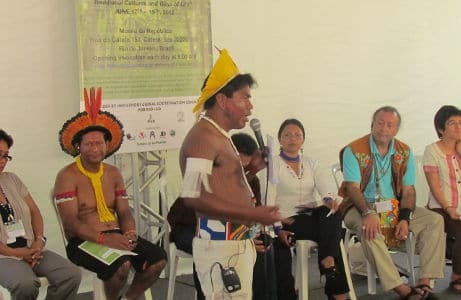 Visit our Training Resources webpage for additional IITC information publications including the Indigenous Peoples, Human Rights and Climate Change and the Indigenous Peoples and the United Nations Post-2015 Sustainable Development Goals information sheets. 65th Annual UN DPI/NGO Conference, 2015 and Beyond: Our Action Agenda, Aug. 27-29, 2014, Opening presentation by Andrea Carmen, IITC, for the IPMG. 10th Session of the Open Working Group on Sustainable Development Goals, Mar. 31 – Apr. 4, 2014, IPMG response to Focus areas and clusters toward the elaboration of targets, presented by Roberto Borrero, IITC. High-Level Event of the UN General Assembly: The Contributions of Women, the Young and Civil Society to the Post 2015 Development Agenda, Mar. 6-7, 2014; Morning Plenary Panel Theme: Closing the inequality gap: efforts for addressing inequalities and meeting new and emerging global challenges for the eradication of poverty. Delivered by Roberto Borrero, IPMG.